You are currently on: How can we use the bicycle to help us build better cities? Dr Kirsty Wild (right), Epidemiology and Biostatistics, with Honorary Academic Dr Adrian Field, Health Systems, Population Health, Faculty of Medical and Health Sciences. The bicycle is what we call a ‘multiple satisfier’: it improves transport efficiency, creates more sustainable neighbourhoods, and lifts quality of life in our cities. Our work explores how we can leverage the power of the bicycle to address the emerging challenges of urbanisation. 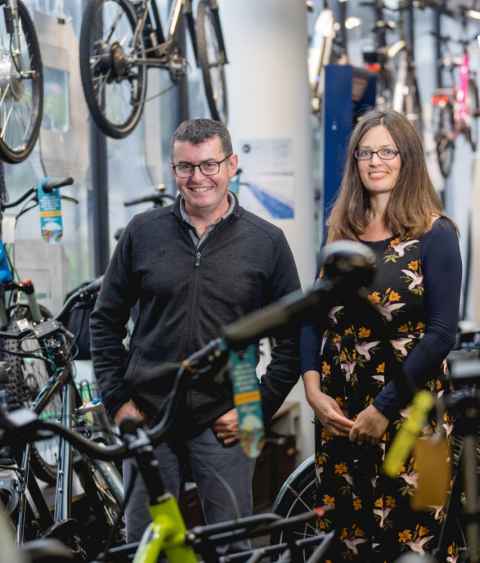 A collaborative venture between the University of Auckland, the University of Otago and transport consultancies Mackie Research and Dovetail Research, our project ‘The Future of the Bike’ looks at how innovations in both bicycle technologies and city planning could improve urban sustainability. Our current work includes modelling the impact of different types of electric vehicles and exploring how e-bikes can improve our transport system. We are also examining ‘bikelash’ - why communities might object to cycle lanes. As scientists, we seek greater collaboration between researchers working in public health, ecology and urban development to find new and innovative ways to realise our commitments to the Sustainable Development Goals.